A historical city that glimmers with its multiculturalism, heritage and rewarding sights. What to do there? Malacca is unique in the way it blends Eastern culture and Western influences so seamlessly. If you would like to experience Malacca as a local, start with the food. Chicken rice balls are a staple and they’re one of the many dishes that has been around in Malacca for a long time. Peranakan cuisine is unique to this part of Malaysia and is one of the best places to get a taste of authentic Nyonya Laksa. Jonker Street is a must-visit whenever in Malacca as it’s a place that retains the old rustic charm in the middle of a developed city. Here you’ll be able to find trinkets, handicrafts and even more savory street food options. What to see there? You know you have arrived in the heart of Malacca when throngs of colorful trishaws dominate the road ferrying passengers. You’ll be able to find a lot of them nearby the brick-red Stadhuys building built in 1650! 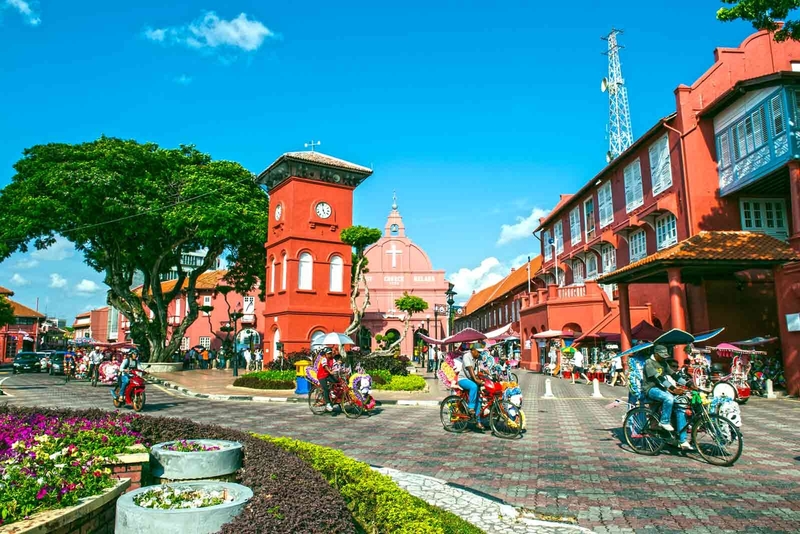 This part of Malacca city is called the Red Square where you’re also able to find historical structures such as Christ Church and Queen Victoria’s fountain. With the iconic remains of the A’ Famosa gate nearby, be sure to keep your camera on the ready. Museums such as the Maritime Museum and Baba Nyonya Heritage Museum offer great educational resources and insight into how Malacca came to be. When is the best time to go there? Bargain when buying items in Jonker Street, you can cut up the price significantly! Don't be afraid to ask the locals what’s good to eat in a certain area, they are happy to help as long you ask kindly. Respect the photography rules put in place by religious institutions. Full of history from the colonial era, age-old traditions and some of Malaysia’s most diverse cuisine, a visit to Malacca is nothing short of an adventure.